Equipping AMOs with the knowledge, skills and qualities required to attend to the health care needs of pregnant women. 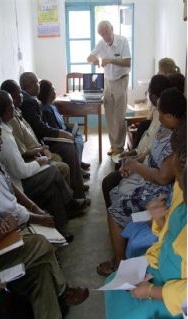 The Assistant Medical Officers (AMOs) in Tanzania attend for a longer training programme and then return to their districts to apply their new skills. There is mentoring and follow-up where possible, but often the students return to remote regions. The curriculum is presented as a framework of characteristics and competencies, designed to guide and support the refresher training of AMOs to handle and manage all emergency obstetric cases at the health facility level. The objective of the curriculum is to equip the AMOs with the knowledge, skills and professional qualities appropriate to the health care needs of pregnant women. It encompasses an educational plan designed to bring about change in the way services are provided. Educational objectives are specified to provide clear information of the knowledge and aspects of practice where competency acquired by the trainee will be assessed. Assessment of competencies is structured to reflect the pathway of learning required throughout training. Competency is achieved through an incremental process of learning and development, so the curriculum indicates ways in which learning will be attained in the key areas of clinical expertise and professional qualities. Students and patients sometimes have significant challenges with a large geographical area to cover but a limited road network. There are some photos of their training, health facilities and the road conditions that they sometimes have to face.